Villa Oasis is a seaside vacation rental in Kassandra Halkidiki. It is a family business offering relaxing self-catering summer holiday homes, far from the crowd, next to pinewood and sandy beach. Villa Oasis offers for rent two ground floor apartments, two middle floor apartments, and two top floor studios. All of them are air-conditioned, with fully equipped kitchen and free Wi-Fi internet connection. 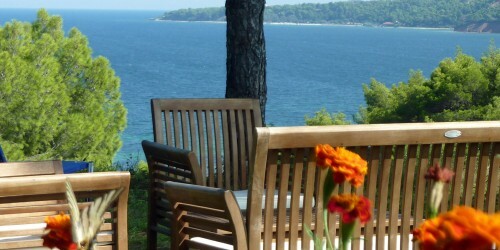 All of them offer superb view above the sea, the beach and the pinewoods of northern Kassandra. The traditional countryside house is surrounded by a beautiful garden with parking, barbeque, and children’s play yard. The sea is 100m away from our garden. The only road to the seashore starts from our property. So the long sandy beach is practically private. Free sun beds and tents for shade are await for you. The sea water is clear, shallow and proper for children. 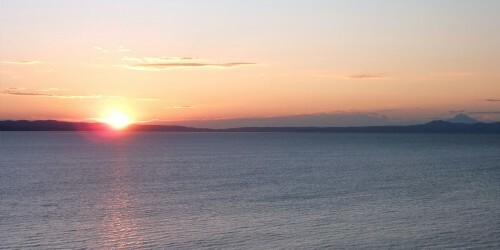 Villa Oasis seaside vacation rental is located in the beginning of Kassandra, the western peninsula of Halkidiki. The point is ideal to start your daily excursions to discover Kassandra, Sithonia, Mount Athos and mount Holomontas in the mainland. The wildest nightlife, the most luxury summer resorts and the best cultural events of Halkidiki are less than 15km away. Enjoy relaxing accommodation far from the crowd, in our seaside holiday homes. All summer we live here and we offer warm hospitality and any help to our guests. Villa Oasis is the ideal vacation rental for relaxing summer holidays in Kassandra, Halkidiki Greece. "Fantastic view over the Sea". The wake up was a real experience with the beautiful view of the sea every morning. Summer vacations mainly mean sea and fun. 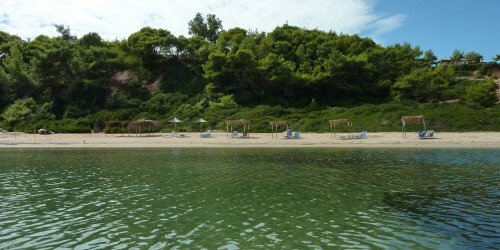 Kassandra, the first peninsula of Halkidiki, is famous for its nature, clear seawater and long sandy beaches. It is also famous for its all day beach-bars, the wild nightlife and the cultural events. Villa Oasis does not offer only rooms to let or apartments just for bed and breakfast. Our countryside villa is not only built in a magnificent landscape of Kassandra, next to pinewood and sandy beach but it is also surrounded by a beautiful private flower garden. 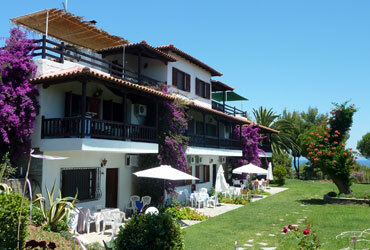 Villa Oasis is located 70 km south of Thessaloniki in the beginning of Kassandra, the western peninsula of Halkidiki. Our villa is situated, far from the crowd, in a peaceful landscape in the countryside.